Remember, no value – no price. But value does not mean you can charge for it. That was the reference price effect. If the customers have never paid for it and there are no other comparisons then their reference price for a product/service is $0 regardless of the value delivered. For example, will you pay for email? So when introduced without focusing on reference price, unbundling faced customer backlash and castigation by customer service gurus who strongly believe in enchanting and delighting all customers at any cost. Fast forward to present day. 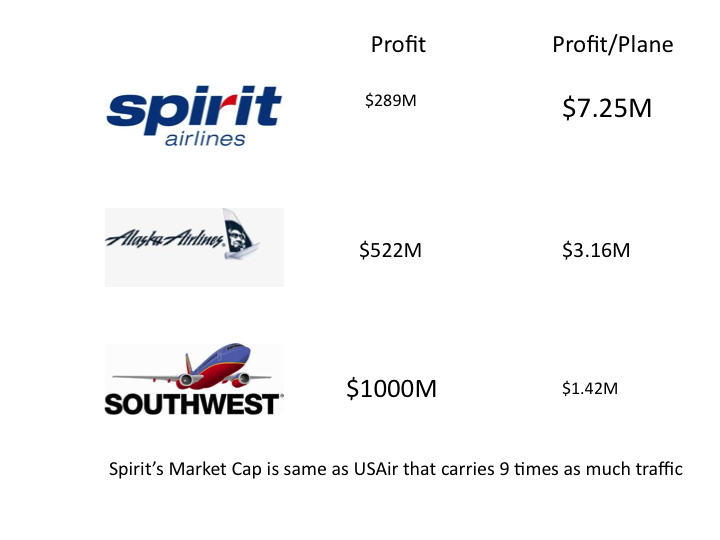 Spirit is now the number one airline on profit per plane metric. Despite what customer service gurus say about delighting customers, Spirit delivered no service other than safely transporting customers, did nothing remotely to delight its customers and yet saw its market value double since its IPO. Let us return to the quote in the beginning of this article. What Spirit airlines has done may look like taking unbundling to the extreme. But it is actually taking a segment driven strategic approach to unbundling showing us all the power of customer segmentation. Target Segment: Despite what most believe, it is not possible to serve all customers. Stated more precisely, it is not possible to fill all needs at all situations. Spirit is not going after the lucrative business segment that does not pay out of its pocket. They are going after price driven segment that makes purchasing decision purely based on price and is flying on their own dime. Competition: They don’t see any of the major airlines as their competition. Having chosen the strategy of low price and no-frills, they see as competition other cheaper options available to customers. That is, Spirit sees Greyhound bus as its competition, not American Airlines. They are happy to yield other segments to other airlines. As Spirit CEO said, “want to check-in a few bags? Southwest is a better option for you”. Price-Value Alignment: When introducing Kindle Fire, Mr. Jeff Bezos said, “premium product at not so premium price”. That unfortunately is a price-value misalignment. Spirit does not say such a thing. Having chosen the low price it wants to offer, it designed a product that it can deliver profitably. The number one reason its target segment hires Spirit airlines is to get to their destination at the lowest possible cost. Spirit does that well. Marketing : We hear a lot about marketing from management gurus like how delighted customers create word-of-mouth marketing. For Spirit a few dissatisfied customers are actually creating negative WoM. That is actually a result of these customers wrongly self-selecting themselves to travel Spirit airlines. Spirit does not want to attract those who expect any kind of service. WoM, positive or negative is a non-issue for them. Their marketing, at 0.1% of their revenue, is reaching the price driven segment. Nothing more. It is not about stories, not about conversations and not about engagement. What we see here is the need for strategy in running any business and not blindly following one size fits all advice. You cannot deliver premium product at low price to all customers. Everyone will be delighted to get a great product and service. But not everyone will pay for it. There exist a segment that is willing to opt purely on price just to get their most primary need addressed. Despite what you see and hear about a businesses’s number one goal as serving its customers, if serving customers does not deliver profit you don’t have a business. ← Can you afford to set your pricing wrong?